MHSS students Mark Ang (left) and Kyara Christelle Riguerra (right) are among the Department of Science and Technology’s 11th Youth Excellence in Science Awardees. Two students of Malayan High School of Science (MHSS) were recognized in the 11th Youth Excellence in Science (YES) Awards last February 14 at the Philippine International Convention Center, Pasay City. 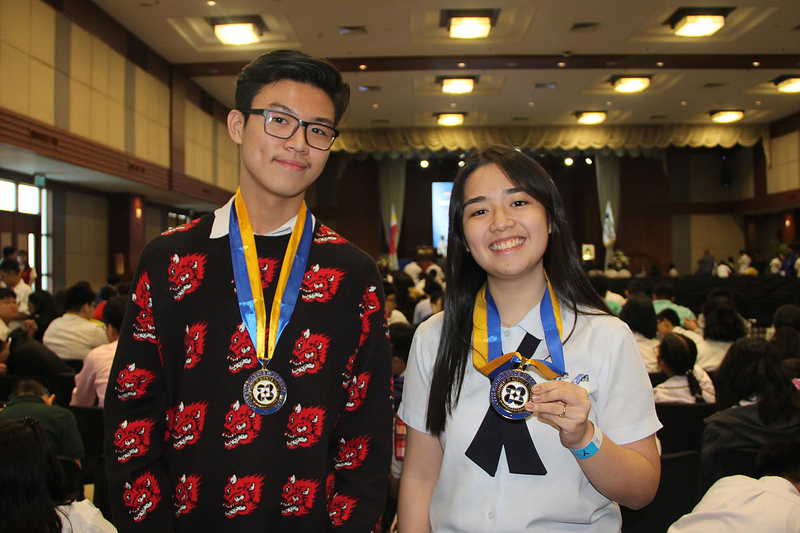 Grade 10 student Kyara Christelle Riguerra and Grade 9 student Mark Julius Ang received the YES Award, a medal of distinction given by the Department of Science and Technology, for their achievements in international science and mathematics competitions. Riguerra and Ang both took home bronze medals from international competitions they participated in. Riguerra aced the World Mathematics Invitational Finals held in July 2018 in Seoul, South Korea, while Mark Julius Ang excelled in the World Educational Robot Contest held in December 2018 in Shanghai, China. According to MHSS Principal Emmillie Joy Mejia, the series of achievements of its students is a testament to MHSS’s commitment in providing quality education as well as its strength in science and mathematics education. “This recent recognition demonstrates that the school is an instrument in training students to be well equipped and well developed individuals in learning and applying their knowledge in real-life situations,” Mejia said. Established in 2006, Malayan High School of Science is one of the leading science high schools in the country. It offers advanced science curricula, houses state-of-the-art facilities, and uses digital technologies for instruction and educational resources.